Nationality: Russian. Born: Denis Arkadievitch Kaufman in Byalistok, Poland (then annexed to Russia), 2 January 1896. Education: Studied at the music academy in Byalistok, Poland, 1912–15; also attended medical school in St. Petersburg/Petrograd, 1916–17. Family: Married Elizoveta Svilova. Career: Set up a lab for the study of sound while a student, 1915–17; adopted pseudonym "Dziga Vertov" (translates as "spinning top"), and became editor and writer for newsreel section of Moscow Cinema Committee, 1917; directed first personal film and published Kinoks-Revolution Manifesto, 1919; organized film activities on government agit-steamboats and agittrains, 1921; began developing theory of "Kino-Glaz" (Kino-Eye), 1922; worked on Kino-Pravda and Goskinokalender newsreel series, 1922–25; directed newsreel series Novostidnia , from 1947. Died: 1954. Statii, dnevniki, zamysly , edited by S. Drobashenko, Moscow, 1966. Dsiga Wertow: aus den Tagebüchern , edited by Peter Konlechner and Peter Kubelka, Vienna, 1967. Articles, Journaux, Projets , edited and translated by Sylviane and Andrée Robel, Paris, 1972. Kino-Eye: The Writings of Dziga Vertov , edited by Annette Michelson, Berkeley, 1984. "Iz rabochikh tetradei Dziga Vertov," in Iskusstvo Kino (Moscow), no. 4, 1957. "Vespominaiia o s'emkakh V.I. Lenin," in Iz Istorii Kino (Moscow), no. 2, 1959. "Manuscrit sans titre," translated by J. Aumont, in Cahiers du Cinéma (Paris), May/June 1970. "Doklad na pervoi vsesoyuznoi . . . ," in Iz Istorii Kino (Moscow), no. 8, 1971. Various articles in Film Comment (New York), Spring 1972. "From the Notebooks of Dziga Vertov," translated by Marco Carynnyk, in Artforum (New York), March 1972. "Dak rodilsja i rasvivalsfa Kinoglaz ," in Iskusstvo Kino (Moscow), February 1986. Bryher, Winnifred, Film Problems of Soviet Russia , Terrutent, Switzerland, 1929. Lozowick, Louis, Joseph Freeman, and Joshua Kunitz, Voices of October: Art and Literature in Soviet Russia , New York, 1930. Marshall, Herbert, Soviet Cinema , London, 1945. Dickinson, Thorold, and Catherine De La Roche, Soviet Cinema , London, 1948. Eisenstein, Sergei, Film Form , edited and translated by Jay Leyda, New York, 1949. Pudovkin, V.I., G. Alexandrov, and I. Piryev, Soviet Films: Principle Stages of Development , Bombay, India, 1951. Babitsky, Paul, and John Rimberg, The Soviet Film Industry , New York, 1955. Abramov, N.P., Dziga Vertov , Moscow, 1962; Lyons, 1965. Borokov, V., Dziga Vertov , Moscow, 1967. Geduld, Harry, editor, Film Makers on Filmmaking , Bloomington, Indiana, 1967. Issari, M. Ali, Cinéma Vérité , East Lansing, Michigan, 1971. Sadoul, Georges, Dziga Vertov , Paris, 1971. Kuleshov, Lev, Kuleshov on Film , translated and edited by Ronald Levaco, Berkeley, California, 1974. Feldman, Seth, Evolution of Style in the Early Work of Dziga Vertov , New York, 1977. Feldman, Seth R., Dziga Vertov: A Guide to References and Resources , Boston, 1979. Petric, Vlad, Constructivism in Film: The Man with the Movie Camera: A Cinematic Analysis , Cambridge, 1987. Lenauer, Jean, "Vertov, His Work, and His Future," in Close-Up (London), December 1929. Hughes, Pennethorne, "Vertov ad Absurdum," in Close-Up (London), September 1932. Koster, Simon, "Dziga Vertov," in Experimental Cinema (New York), no. 5, 1934. Vaughan, Dai, "The Man with the Movie Camera," in Films and Filming (London), November 1960. Weinberg, Herman G., "The Man with the Movie Camera," in Film Comment (New York), Fall 1966. Abramov, Nikolai, "Dziga Vertov, Poet and Writer of the Cinema," in Soviet Film (Moscow), no. 11, 1968. Rotha, Paul, and Richard Griffith, in Documentary Film , New York, 1968. Giercke, Christopher, "Dziga Vertov," in Afterimage (Rochester), April 1970. Brik, Osip, "The So-called 'Formal Method,"' translated by Richard Sherwood, in Screen (London), Winter 1971/72. Bordwell, David, "Dziga Vertov: An Introduction," in Film Comment (New York), Spring 1972. Michelson, Annette, "The Man with the Movie Camera: From Magician to Entomologist," in Artforum (New York), March 1972. Enzensberger, Marsha, "Dziga Vertov," in Screen (London), Winter 1972/73. Feldman, Seth, "Cinema Weekly and Cinema Truth: Dziga Vertov and the Leninist Proportion," in Sight and Sound (London), Winter 1973/74. Brik, Osip, "Mayakovsky and the Literary Movements of 1917–30," translated by Diana Matias, in Screen (London), Autumn 1974. Mayne, J., "Kino-truth and Kino-praxis: Vertov's Man with a Movie Camera ," in Ciné-Tracts (Montreal), Summer 1977. Denkin, H., "Linguistic Models in Early Soviet Cinema," in Cinema Journal (Evanston), Fall 1977. Fischer, L., "Enthusiasm: from Kino-eye to Radio-eye," in Film Quarterly (Berkeley), Winter 1977/78. "Dziga Vertov," in Travelling (Lausanne), Summer 1979. Rouch, Jean, "Five Faces of Vertov," in Framework (Norwich, England), Autumn 1979. "Vertov Issue" of October (Cambridge, Massachusetts), Winter 1979. Petric, Vlad, "The Difficult Years of Dziga Vertov: Excerpts from His Diaries," in Quarterly Review of Film Studies (New York), Winter 1982. Tesson, C., "L'homme sans limites," in Cahiers du Cinéma (Paris), July-August 1987. Dziga Vertov, pioneer Soviet documentarian, was born Denis Arkadievitch Kaufman. He and two younger brothers, Mikhail and Boris, were sons of a librarian in the Polish city of Byalistok, which at the time was within the Tsarist empire. When World War I broke out, the parents took the family to what seemed the comparative safety of Petrograd (St. Petersburg was renamed to expunge the Germanic link). When the Bolshevik revolution began, Denis, who was twenty-one, and Mikhail, who was nineteen, became involved. Denis volunteered to the cinema committee and became a newsreel worker. Soon he was editing footage of revolutionary upheaval and the struggles against American, British, French, and Japanese intervention forces. His hastily assembled reels went out as war reports and morale boosters. He became known as Dziga Vertov, a name that suggested a spinning top and a choice that was perhaps meant to convey perpetual motion. The newsreel, titled Kino-Nedelia ( Film Weekly ), continued until the end of the hostilities in 1920. Vertov also used selected footage for the multi-reel Godovshchina revoliutsiva ( Anniversary of the Civil War ) and other compilations. Vertov hoped to launch a more ambitious series of film reports on the building of a new society, but a period of frustration followed. A new economic policy, introduced as a temporary measure, permitted limited private enterprise to stimulate the prostrate economy. Cinemas, which were allowed to import foreign features, were soon filled with old American, German, French, and English films. An outraged Vertov turned into a polemicist, a writer of fiery manifestos. Addressing the film world, he wrote: "'Art' works of pre-revolutionary days surround you like icons and still command your prayerful emotions. Foreign lands abet you in your confusion, sending into the new Russia the living corpses of movie dramas garbed in splendid technological dressing." He tended to look on these films, and even on fiction films in general, as dangerous corrupting influences, another "opium of the people." He urged producers to "come to life." His vitriol won Vertov enemies in the film world, but he also had support in high places. Early in 1922 Lenin is said to have told his Commissar of Education, Anatoli Lunacharsky, "Of all the arts, for us film is the most important." Lenin emphasized newsreels and proclaimed a "Leninist film-proportion": along with fiction, film programs should include material reflecting "Soviet reality." All this enabled Vertov to launch, in May 1922, the famous Kino-Pravda ( Film-Truth ), which continued as an official monthly release until 1925. His wife, Elizoveta Svilova, became film editor. Mikhail Kaufman gave up a planned law career to become his brother's chief cameraman. The Kino-Pravda group scorned prepared scenarios. 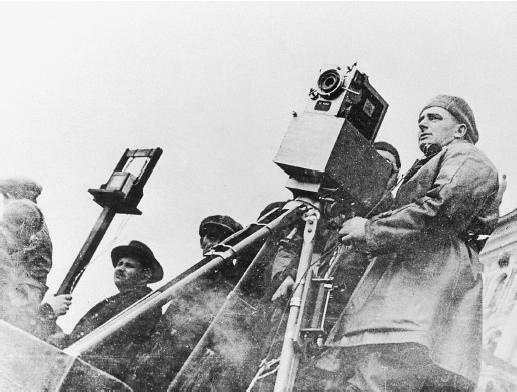 Vertov outlined ideas, but left wide latitude to Mikhail and other cameramen. Sallying forth with cameras, they caught moments when a Moscow trolley line, long defunct in torn-up streets, was finally put back into action. Army tanks, used as tractors, were seen leveling an area for an airport. They shot footage of the staff of a children's hospital as it tried to save war-starved waifs. A travelling film team was seen arriving in a town, unpacking gear, and preparing an outdoor showing—of Kino-Pravda. The reels were always composed of "fragments of actuality," but Vertov also put emphasis on their provocative juxtaposition. Superimpositions, split screens, slowed or speeded motion could play a part in this. If the fragments were "truths," the manipulations were intended to bring out other "truths"—relationships and meanings. For a time the Kino-Pravda releases were virtually the only item in cinema programs that touched the historic movement, and they therefore had a wide impact. Footage was from time to time reused in combination with new footage in feature documentaries. Among the most successful was Shestaya chast' mira ( One Sixth of the World ), in which Vertov made impressive use of subtitles. Short, intermittent subtitles formed a continuing apostrophe addressing the people of the Soviet Union. "You in the small villages . . . You in the tundra . . . You on the ocean." Having established, via footage and words, a vast geographic dispersion, the catalog turned to nationalities, "You Uzbeks . . . You Kalmiks." Then it addressed occupations, age groups, sexes. The continuing sentence went on for minutes, then ended with, "You are the owners of one sixth of the world." The incantation style, reminiscent of Walt Whitman—who was much admired by Vertov—continued throughout the film, projecting the destiny foreseen for the "owners." To men and women with only a dim awareness of the scope and resources of their land, the film must indeed have been a prideful pageant. Vertov's career gradually became clouded, especially in the Stalin years. His aversion to detailed scenarios, which he said were inapplicable to reportage documentaries, marked him as "antiplanning." He agreed to write "analyses" of what he had in mind, but his proposals were often rejected. Articulated social doctrine was increasingly mandatory; experiments in form were decried. Ironically, Vertov remains best known for one of his most experimental films, Chelovek s kinoapparatom ( Man with a Movie Camera ). Featuring Mikhail in action, and intended to demonstrate the role of the cameraman in showing "Soviet reality," it also became an anthology of film devices and tricks. Eisenstein, usually a Vertov supporter, criticized it for "unmotivated camera mischief" and even "formalism." During the following years Vertov and Kaufman worked in the Ukraine studios, apparently a reflection of disfavor in Moscow. But in the Ukraine Vertov created one of the most inventive of early sound films, Entuziazm: Simfoniia Donbassa ( Enthusiasm: Symphony of the Don Basin ), a virtuoso exploration of the possibilities of nonsynchronous sound. Another such exploration was the moving Tri pesni O Lenine ( Three Songs about Lenin ), which utilized the precious fragments of Lenin footage. But Vertov had lost standing. In his final years he was again a newsreel worker, arriving and leaving the job on schedule, no longer writing manifestos. Vertov's ideas were, however, echoed in later years in cinéma vérité, the movement of the 1960s named after Vertov's Kino-Pravda. The 1960s and 1970s saw an international revival of interest in Vertov. This revival included rehabilitation of his reputation in the Soviet Union, with retrospectives of his films, biographical works, and publication of selections from Vertov's journals, manifestos, and other writings.